The Contents Program of Automotive Dealer Day wants to provide information, strategies, tools and new incentives to develop the business. Thanks to the coordination of subjects of Leonardo Buzzavo (founder and President of Quintegia, Professor of Business Strategy at Ca’ Foscari University), and with the collaboration of Luca Montagner (Quintegia – ICDP), Gabriele Maramieri and Tommaso Bortolomiol (Quintegia), Automotive Dealer Day 2013 pays serious attention to the hot topics for the Italian market, involving more than 85 speakers. The topics will focus on strategic choices, financial management, marketing and communication, Internet, second-hand market, post-sales. More than 16 dealers will intervene as speakers. In addition to the traditional sessions, Master classes and Fast Workshops will foster the Contents Program in order to improve the competences and in a more interactive way. As outlined below, in the 2013 edition, as it has never happened before, we have worked to bring International and inter-sector experiences in order for debating on themes, which are relevant for Italy, on a wider perspective. 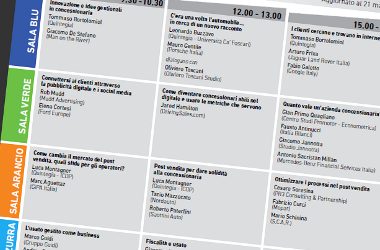 Click here to find out in details the Content Program of Automotive Dealer Day 2013. Information and the continuous updates are available on the event website www.dealerday.it and on twitter following the hashtag #add13.